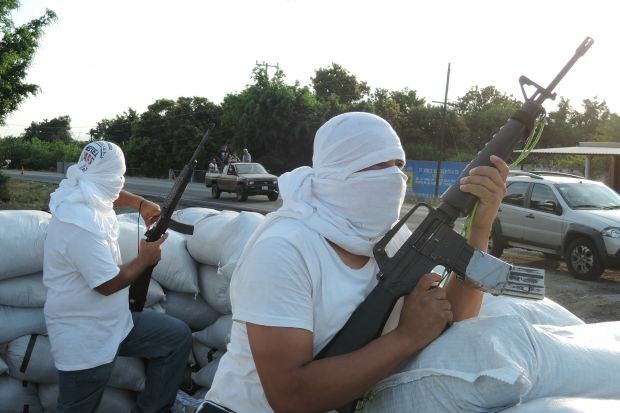 NUEVA ITALIA, Mexico (CNS) — A Mexican bishop has rebuked the federal government for sending soldiers to grab the guns of the self-defense groups formed to fight off violent drug cartels and criminal gangs in the western state of Michoacan. Bishop Miguel Patino Velazquez of Apatzingan said the strategy was wrong and targeted the people trying to protect themselves. “The army and government have fallen into discredit (with locals) because instead of pursuing the criminals, they attack the people defending them,” the bishop wrote of the situation in the area known as Tierra Caliente (Hot Earth). Bishop Patino issued a pastor letter Jan. 15, shortly after an attempt by soldiers to disarm self-defense group near the town of Antunez went awry, leaving at least three villagers dead. The incident demonstrated the deep distrust many in this rugged region of Michoacan have in their institutions, which have been unable or unwilling to dismantle a drug cartel known as Knights Templar and its predecessor, La Familia Michoacana, over the past seven years. Self-defense groups formed in February 2013 to run off the Knights Templar, whose henchmen were accused of everything from running extortion rackets to kidnap to sexual assaults. Self-defense groups captured Nueva Italia amid gunfire Jan. 12. The federal government assumed responsibility for security matters in the Tierra Caliente region of Michoacan the next day, telling the self-defense groups to disarm and sending in soldiers and convoys of federal police officers. The leaders of an organization of the self-defense groups in Michoacan said Jan. 15 they would not attempt to take control of any more communities and proposed coordinating efforts against organized crime. The government posture toward the self-defense groups surprised some observers. “I thought the government was using the (defense groups) to resolve this problem so it wouldn’t have to get involved more,” said Father Patricio Madrigal, pastor of the Our Lady of Guadalupe Parish in Nueva Italia. Father Madrigal and residents too fearful to give their names said the arrival of the self-defense groups was anticipated, and the groups asked for popular support before moving in. Earlier in January, Interior Minister Miguel Angel Osorio Chong had spoken well of the groups’ leader, Jose Manuel Mireles, who was later injured in a crash landing on a clandestine airstrip and protected by the government while hospitalized. Protests have surged recently against the presence of federal security forces and vigilantes, and demands were made for the government to disarm the self-defense groups, which demonstrators allege are being armed and infiltrated by an out-of-state criminal group. Churchmen in the region say other criminal groups made overtures to fight off the Knights Templar cartel, but locals rejected the offers. Church leaders also allege the protests have been promoted by cartel members, who have burned businesses and delivery vehicles and attempted to impede commerce in an attempt to regain control of lost criminal territories. Mexico’s crackdown against cartels began in Michoacan seven years ago and has claimed more than 75,000 lives since. The reach of the Knights Templar is so extensive that priests in the Diocese of Apatzingan speak of merchants paying the cartels an extra peso per kilos of tortillas. Butcher shops added a “tax” to the price of each cut of meat, and poor people selling fruit were made to hand over money. “The person cleaning windshields in the intersection had to pay. It reached that extreme,” said Father Madrigal, who noted that the rise of self-defense groups in other communities was enough to make the extortion stop for some in Nueva Italia. The insecurity has impacted the church, too. Locals ventured out less so they attended fewer church services, where prayers are often offered for the missing. The diocese started a ministry to provide attention to victims of crime, but victims do not want to draw attention to themselves. “They (cartels) make the people they don’t like disappear,” Father Madrigal said. Strong statements from Bishop Patino have gained national attention and put a spotlight on violence in Tierra Caliente and the rest of the country. The federal government now speaks sparingly of insecurity and instead promotes an image of Mexico advancing economically. The church in Michoacan and Mexico as a whole has stayed somewhat silent during the drug war, but Bishop Patino, who revealed that five of his priests have been killed in 17 years, appears to be breaking the silence.